It is often said that other than war, only three other things unify this vast and diverse nation of ours. They are Elections, Cricket and Movies. Of the movies, the one that must have been watched by the largest number of Indians to date would be “Sholay”. The movie is a cult classic, a trendsetter and an evergreen entertainer. Its impact in the popular culture of the country can be felt even today. One can find ads spoofing it or it being referenced in one way or the other in every Indian’s daily life. The excitement about the movie is expected to reach a crescendo with the imminent release of its remake by a prominent Bollywood director. 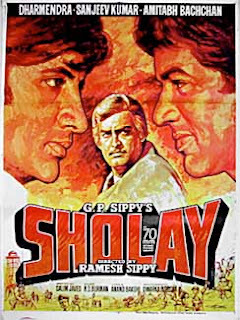 Released in 1975 and directed by Ramesh Sippy, Sholay is the story of a village where people live in perpetual fear of a bandit gang led by the infamous Gababr Singh. A retired police officer of the village named Thakur Baldev Singh, himself a victim of Gababr’s atrocities, enlists the services of two convicts to capture Gabbar. 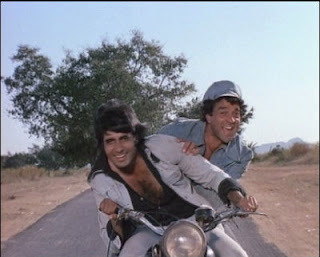 The two convicts Jaidev and Veeru learn during the course of their stay at the village that Thakur’s entire family was murdered by Gabbar (with the exception of his daughter-in-law, who was not at home at the moment). 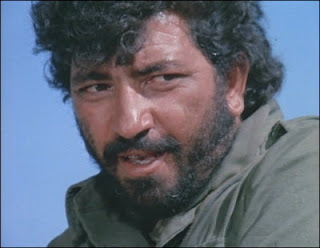 Thakur however is unable to take revenge upon Gabbar as the latter had cut off Thakur’s hands. In the village, Veeru falls in love with the chatterbox Basanti who makes a living by riding a horse-cart. While the more serious Jaidev feels drawn to Radha, the reclusive widowed daughter-in-law. The duo of Veeru and Jai constantly thwarts the plans of the bandits when they try to raid the village. However matters come to a head when Viru is captured by the bandits when he tries to rescue a kidnapped Basanti from their clutches. How they overcome Gabbar and how Thakur extracts his revenge forms the rest of the story. Sholay is considered a masterpiece mainly because it got all the ingredients of a blockbuster right as far as Indian movie audiences go. It had a high power star cast with some of the big names of the time in the industry collaborating in the movie. It even propelled the careers of future big names like Amitabh Bachan and Gabbar Singh. Often multi-starrers take away the focus of the director from telling the story to making the stars look good. However in this case though all the actors give powerhouse performances that enriches the movie to no end. Sanjeev Kumar as the Thakur desperate for revenge is riveting and lends credibility to the character and his emotions. Dharmendra as the extrovert Viru is colourful and essays the role with ease. Amitabh Bachan as the serious Jaidev essays a role that would become a template for his future career defining roles. He would later go on to become a superstar on the back of those roles. Unusually for a movie of this kind the women are not degenerated to mere show pieces but have characters with substance to essay. Hema Malini essays the role of Basanti with such conviction that nobody hence has been able to essay the role of the chatterbox village belle with such aplomb. Jaya Bachan as the ill-fated widow gives a performance where her silence is as memorable as any of the great dialogues in the movie. But the tour de force performance of the movie definitely comes from Amjed Khan as the evil Gabbar Singh. It is ironic to think that he was not even the first choice for the role. He gives the character, which not just enjoys evil but actually revels in it, a larger than life attribute that makes both the character as well as his performance truly memorable. He gave such a great performance that all his subsequent performance never seemed to achieve the same heights. The movie as said earlier had all the ingredients of a Bollywood blockbuster: good music, a comedy track and drama. The background music by R.D. Burman enhances the underlying tension in the movie manifolds. But the real stars of the movie are the script-writer duo of Salim and Javed. Sholay was one of those movies which had its dialogues released in audio cassettes. It went on to become bestseller on its own. Every kid in India even today knows at least one memorable dialogue from the movie. The technicalities of the movie too were brilliant for the time it was released. Ramesh Sippy captured the mood of the movie to a T by shooting it in the rocky taverns of Ramanagaram. The place is so much identified with the movie that a part of it was later renamed ‘Sippynagar’. His techniques were innovative. As part of the story he would have been required to show some brutally violent scenes. His use of symbolism not only helped him get past the strict censors of the time but also gave the movie that masterly feel of leaving the more brutal scenes to the imagination of the audience. This in fact made those scenes even more terrifying without actually showing any gory details. It also helped that the great action sequences in the movie were conceived by someone from Hollywood. It was also the first 70mm stereophonic Indian movie that enhanced the theatre experience of the film. When the movie got released it was not met with favorable reviews or response. Many felt it was a flawed attempt at making a Spaghetti Western with Indian values. Theatre owners wanted the length of the movie to be shortened. Many trade insiders and columnists even started declaring it as an expensive flop. Then slowly the cinema halls started to fill up with people who came to watch the movie because their friends liked it. All of a sudden the movie became a cult craze and queues that stretched more than a kilometer began to be formed outside the theatres. People began to watch the movie multiple times and it became usual to meet people who have watched the movie 30-40 times. So much so that later on the shows became a karaoke experience with the entire audience mouthing dialogs in unison with the actors on screen! The movie was later declared a superhit and went on to become the highest grossing film in Indian movie history. Some claim that it still is when you consider inflation and other factors. It created history when it ran in Bombay’s Minerva theatre continuously for 5 years. In its wake several films were released that tried to cash in on the trend of multi-starrers and male bonding. But none of them were able to recapture the magic of Sholay. When it was shown on Indian televisions for the first time in 1994 it is said that streets became empty during its screening. Sholay epitomizes the magic of the Bollywood even today. I have to say that I find the whole 'Bollywood' industry quite fascinating. I gave a class to some students on the subject last year and they were amazed both by the amount of films produced and the worth of the industry. They had actually never heard of 'Bollywood' so imagine their surprise when I handed them figures of film production and actors/actresses salaries in comparison to Hollywood. I think that 'Bollywood' is truly a very unique Indian genre that remains an enigma to many outside India. I guess it's a contemporary Indian art form which shows that globalisation won't destroy the rich and diverse culture of a very strong and proud people. Have a nice weekend - what's left of it!! Here in Greece is Sunday after noon now,I say Hello to you,nice to meet you,i like your post and i will look for the film Sholay. How nice it is to communicate with the other side of the moon,as you said. interesting things about indians movies.